This Machine Use New&Creative Technology That Combined The Cavitation Fat System&Dermabrasion Beauty In One Machine. 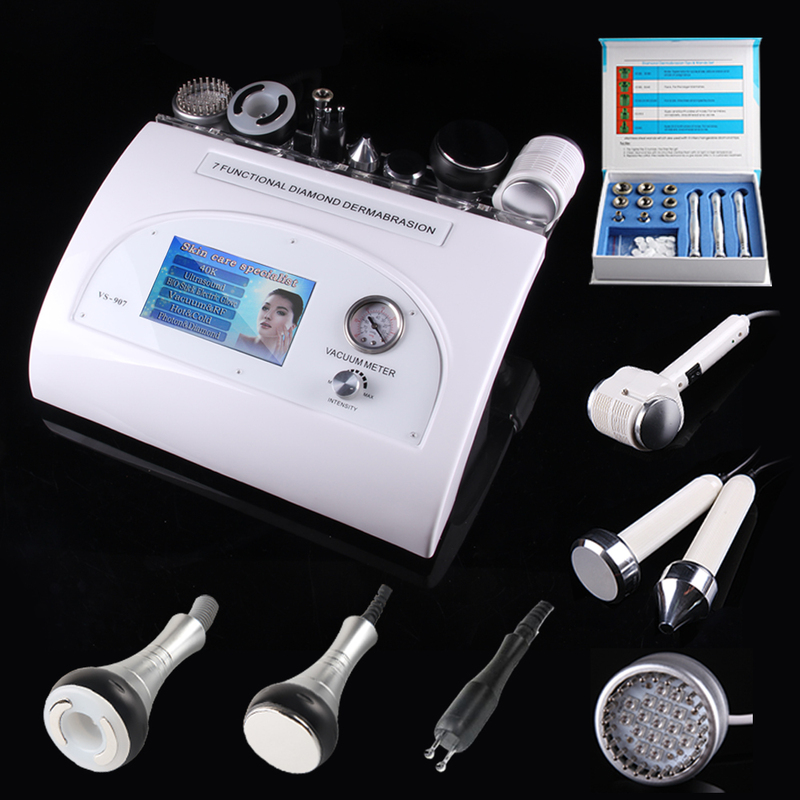 It is 7in1 New&Best Match with 40K Cavitation+1Mhz Ultrasonic+Vacuum RF+Dermabrasion+Photon+Hot&Cold+BIO which is useful for both weight loss and skin rejuvenation. A best choice for those who has the love of beauty both in face&Body. This will help you tighten,lift&Tone your face skin and shape your body so that you can be the evry of Female and the charming of male. Believe that you are a perfect&Lucky girl. it is a creative improvement of the Micro-Dermabrasion. The Diamond Dermabrasion provided a non-surgical skin refinish procedure, by using sterile diamond heads to abrade or rub off the top skin layer, then Vacuuming out the particles along with any dirt and dead skin back up. This procedure removes skin debris, imperfections, blemishes, wrinkles and unwanted pigmentation on the skin. Moderate usage of Diamond Dermabrasion, accompany with skin products that penetrate through top skin layer that reach the dermis level, helps to replenish natural nutrients, restore cell activity, and promote skin health. The results after Micro Dermabrasion is usually a healthy, glowing, beautiful skin. This machine have multi function suitable for personal home use . Ultrasonic head make strong sound wave may cause fierce impact of fat cells to make them be exploded instantaneously, reduce the amount of fat cells and thereby achieve the effects of removing fat. It use on belly, legs, waist and arm. RF & Vacuum adjust suction strength to rub directly explode thick fat, enhance blood circulation, accelerate the decomposition of fat, take away wastes, enhance the effect of removing cellulite. It use on belly, stomach, thigh, back, arm, leg. Hot hammer fast created warm accelerate blood circulation, get more collagen, cold hammerm can reach to 0-5°C to quickly shrink pores, allowing skin to quickly lock in moisture. It can use on face and body.